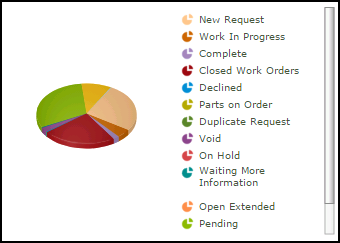 Below is a list of all the different Work Order Statuses that can be used to track the progress of a work order. In the table you will see the definition of each status, whether it is considered an open status, and a typical scenario of when it might be used. The only two statuses that can automatically stop the aging of a work order, referenced in reporting as Days Aged, are Complete and Closed. The Declined, Duplicate, and Void statuses that are also marked "No" in the "Is it Open?" column below will not automatically stop the aging of a work order. However, if a work order is marked "No" in the "Is It Open?" column below, it will not impact the data calculated in your KPIs. If you would like to stop the aging of a work order no matter what status it is in, we recommend you manually fill in an Actual Completion date on the work order. New Request New work orders are initially set to this status. Generally, they have not been assigned to someone for the work to be completed. Typically, there is not an action taken on the job yet. Yes First stages. We are not 100% sure who will do the job or if we will perform it. Work in Progress Any work order assigned or scheduled to be completed. Typically at this stage, the work Order has been reviewed and assigned to a Technician for corrective repair. Yes We are on the job. Complete A complete status signifies that all actual, physical work has been performed. Transactions such as purchases or labor may not be fully captured on the work order yet, but this will alert personnel that the work has been done. No The job is done. Closed Both physical work and administrative documentation is concluded. Once all transactions and notes are added into the work order, or if corrective action has been verified, this is often when work is “closed”. Once a work order is closed, no more transactions can be added unless you reverse the status back to “Complete” in order to capture new entries for labor, materials, etc. No The job and any documentation about the job is done. Pending The job will be done, but not until resources are ready. PM work orders often initially have a status of “Pending”. Yes It is in the hopper, but more pressing needs have to be attended to first. Open Extended Any work order that you want to keep open for an extended amount of time. This can be used to keep track of labor hours for a general task done daily or for seasonal work (e.g., snow removal, grass cutting) Yes There is no need to create work orders for every day if I am tracking labor, so keep it simple with an open job for several weeks or months. Journal Notes are helpful for any additional documentation by date. Parts on Order The work order is waiting for the arrival of parts before continuing. Yes We will be on the job when supplies arrive. It is handy to use the Action Taken field to let everyone know when supplies are expected. On Hold Work is paused (besides waiting for parts or waiting on more information), perhaps due to coordinating resources. Yes We are not ready yet, but do expect to perform the job. Waiting for More Information If you are waiting for more information from the requester or another person before proceeding the completion of work. Yes The work description was not clear or there are circumstances that need clarification. Waiting Funding This request is waiting for monies or funding to become available before work can begin. Yes If we get the funds, we will do the job, but it is not certain at the moment. Deferred This status is used to show that a work request has been recognized, but is waiting to be performed at a later date. Yes We are identifying the need, but it must be on the backlog until a confirmation or a denial is given. Forwarded Show work orders forwarded to another department. This is often used to route work from facilities to IT (a copy can be automatically replicated to FacilityDude’s Incident solution for technology work tracking). This can be done when a work request is mistakenly entered to the wrong department. Yes This was submitted to the wrong department and we have forwarded it to the correct one. Example: electricians did perform work on telephones years ago until IT added VOIP and they now coordinate telephone communications. Declined Work orders that will not be done. They may be declined by a site administrator or by a person in the maintenance department. No We do not have the resources or that is outside of our typical scope. 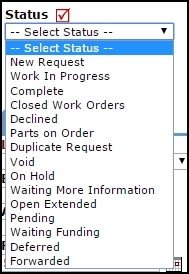 Duplicate Request A previously requested work order already exists. No We know about it and it has been documented elsewhere already. Void Work orders you would like to ignore and not appear in reports unless specifically requested. You cannot delete a work order, so you may want to “void” them, or overwrite the work order content with work you actually do intend to perform. No Ignore this, I was testing what a work order would look like.